Corporate Executive Chef of Foodee Group Concepts, Carlo Miguel, talks to us about what inspires him and why he loves his job. 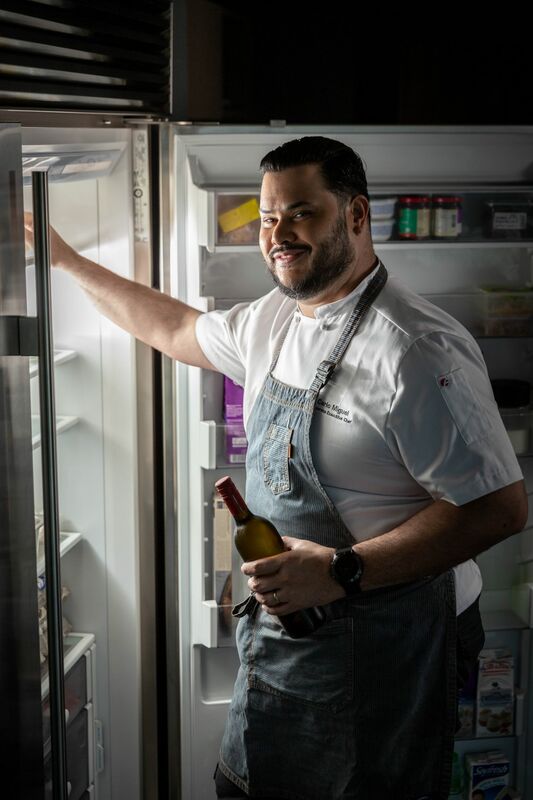 Chef Carlo Miguel is a man who grew up in kitchens, enamored by the skill, creativity, flavours and power that are all present in the culinary world. It all started thanks to dear old mum. This entrepreneurial woman who catered Filipino food to the Filipino community in Sydney, Australia, where they were living at the time, ignited her son’s gastronomic love affair. At the age of 10 or 11, a young Carlo dove straight in by helping his mum butcher meats and prepare dishes. The wafts of savory smells floating about tempted both his mind and palate. He got his first job in a professional kitchen when he was only 15 years old. Carlo said jokingly, but in all seriousness, that aside from holding school books his backpack contained a set of knives as he would rush over to work after class! Before even reaching cooking school , where he further refined his skills, Carlo had spent years in restaurant kitchens and thus was steps ahead of his peers who were just learning how to handle knives and prepare mis en place. After living in cities around the world, this chef has called the Philippines home for years. He is the Corporate Executive Chef for Foodee Group Concepts where he manages a variety of restaurant and food establishments in their portfolio; some of which are Foo’d by Davide Oldani, Todd English Food Hall, Sunnies Café, Bench Café, Pound and Hook. What is your most challenging meal or service and why? Most challenging services are opening nights because it is the first time you are serving guests, the first time they will try the food. It is also the first time for the wait-staff to run the restaurant. There have been occasions when I have had to kick everyone out of the kitchen to do everything myself when things were not working the way they should have been. I would say bold. I do not shy away from strong flavours. I think it is great for the Philippine environment since this market loves strong flavours and spices – it works well because I cook mostly western food which is less bold in flavour. I do western food with the gusto and punch of the Filipino palate. How would you say your food is different from that of your peers? I would say it is highly seasoned. If I say rosemary roasted lamb, the rosemary is really gonna hit you. I believe that Filipino culture has embraced that style of cooking. How do you think the Filipino palate has changed? People were much more closed minded – they took our country for granted. Now we are much more aware of what we have and are more open minded. People always used to look for imported and foreign things. Now we have embraced local produce and our traditional ingredients which I think is fantastic! When I sit down to create a menu. I think of it like a painter with a palette but I see flavours instead of colours. I start with certain flavours in mind rather than ingredients or textures and then go from there. Flavours or ingredients you like to work with? Flavours or ingredients you do not like to work with? Offal. But it depends because you can be surprised with how dishes are prepared. What is your definition of risk? Putting myself on a menu for others to judge. Creation. I love making new things and conceptualizing new menus and dishes. I love being creative. Who would you like to cook for – anyone dead or alive? Joel Robuchon. I would have loved to cook his mashed potatoes for him and to have him tell me how I did. Check out some of his restaurants, and get ready to eat!